It can be shocking to many parents, if not perplexing: many dentists now recommend you schedule your child’s first visit before he or she turns one. Before you brush it off as a bit of overzealous advice, you should know it’s supported by the American Dental Association and American Academy of Pediatric Dentistry—and with good reason! Besides setting your child on a lifelong path of smart dental habits, a lot about your child’s oral health can be revealed and addressed even before he or she has a full set of teeth. Asking a fussy toddler to sit still and open wide may not sound like a walk in the park, but by knowing what to expect and how you can prepare, both you and your child can emerge with a smile. Introducing your child to the dentist sooner rather than later has numerous advantages, the biggest of which is instilling the importance of regular dental visits into him or her at a very early age. 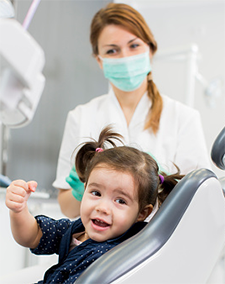 Getting your child accustomed to seeing the dentist can help quell feelings of fear and anxiety that can lead to avoidance of professional dental care later on in life. A close examination of new and emerging teeth can also help identify and treat tooth decay. Even if your child is subsisting only on milk and baby food—improper brushing as well as night-time breast/bottle-feeding can put your toddler’s teeth at risk for cavities. By working closely with a pediatric dentist, the specific causes behind any tooth problems can be determined, and corrected via a treatment plan tailored to your child’s dental situation. Finally, a well-timed visit to the pediatric dentist can translate into cost savings. Staying on top of your child’s oral health and hygiene can keep expensive treatments like fillings, caps, space maintainers or even root canals at bay. Your child’s first visit will certainly be thorough, but not overly invasive. The dentist will want to review the child’s oral history and understand his or her eating and teething behaviors, as well as daily dental routine. Afterwards, the dentist will examine your child’s teeth with your assistance. For better access and viewing, you may be asked to help position your child’s head to rest on the dentist’s lap while his or her feet are resting on you. Depending on your child’s dental situation, sealant may be applied to the teeth for protection against cavities, followed by a demonstration of proper brushing techniques. Once the checkup is complete, your dentist may share a treatment plan based on your child’s dental health and schedule you for a follow-up. Exposing your child to stories or videos that paint dentist visits in a fun, positive light can also make the experience seem less scary. As good as it will feel to achieve your child’s first major “smilestone”, the truth is that every subsequent checkup is just as critical to preserving his or her dental health — as is practicing good dental habits at home. Stay one step ahead of important dental developments by scheduling frequent checkups, and don’t hesitate to call your child’s dentist for help should questions arise in between visits.